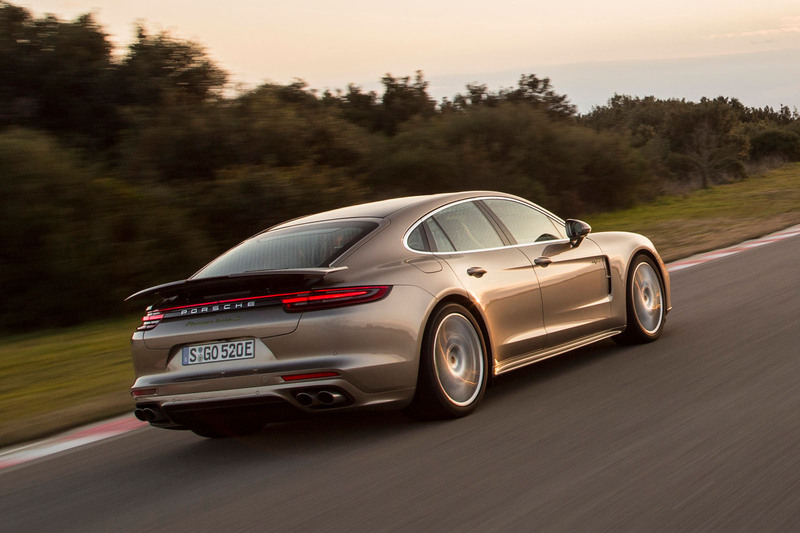 Porsche has revealed a second plug-in hybrid Panamera. This V8 version joins the V6, both of them petrol, and it’s unusual not only for the substantial 671bhp it develops but also for being the first hybrid to serve as the ultimate model in a Porsche model range. The Turbo S also offers usefully more performance and considerably greater economy than the conventional 543bhp V8 Turbo. It will officially travel 31 miles and deliver 97mpg on the (unrealistic) NEDC test cycle, and puts out 66g/km of Co2. 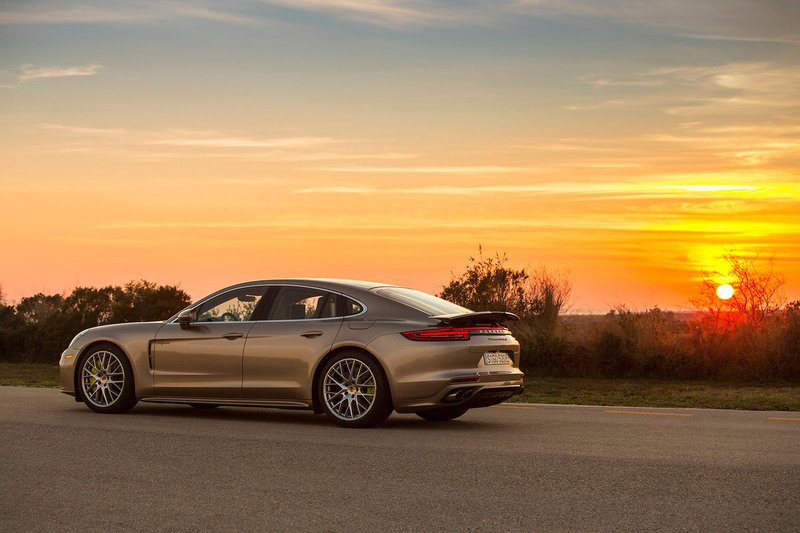 In reality, says Panamera model-line boss Gernot Dollner, it travels 24 to 27 miles on amperes alone, and returns between 22 and 40mpg – not bad for 2310kg car of spectacular performance. The spectacle comes from the Turbo S’s 543bhp 4.0 litre twin turbo V8 and 134bhp electric motor to produce a resounding 627lb ft of torque from as low as 1400rpm. The electric motor and clutch pack are compactly housed within the casing of an eight speed PDK transmission that drives all four wheels. The result is a four-seat plug-in hybrid that will break 62mph in only 3.4sec, bound from that speed to 124mph in 8.3sec and top 193mph, making this the most powerful hybrid saloon in the world, says Porsche, and the fastest. Faster still, though, is Tesla’s pure electric 525bhp, 713lb ft Model S, which storms 62mph in 2.8 (unachievable, in Autocar’s experience) sec. Key features include four driving modes – electric, hybrid, sport plus and boost, which provides a momentary extra power surge – 48-volt electrics to drive the electric anti-roll bars, optional four-wheel steering, torque vectoring, carbon ceramic brakes, three-chamber air suspension, Porsche traction management and launch control. The battery pack needs six hours to charge from a 10amp domestic socket, or 2.4 hours from a 30amp supply using an optional 7.2kW charger. As with other hybrid Porsches, this Panamera’s driveline is configured to allow it simply to coast when the accelerator is released, energy recuperation occurring only under braking. Much effort has been invested to maximise the conversion of kinetic energy, and preserve electric range. Dollner says that this is the most complex roadgoing Porsche yet engineered, offering no less than 6000 individual customer control options, and containing 100 million lines of computer code. An airliner carries a mere 10 to 15 million lines. The Turbo S goes on sale this July costing £137,140. There’s a crest on this Nardo test track that briefly launches this Panamera skywards. The crest is momentarily blind, your view a triple layer of Tarmac, Mediterranean sea and above that, sky. Despite its heft this Panamera hybrid lands well, feeling as thoroughly planted and secure as it does during the rest of this lap of a track replicating several Nurburgring switchback twists. Le Mans 2010 winner Timo Bernhard is our chauffeur and until today he had not driven this car. He claims to be surprised at how keenly it points into bends, despite feeling the car’s not inconsiderable weight. ‘It responds as I would expect a sports car to respond in terms of feedback,’ he says. Launch control propels us from the pitlane like a champagne cork, the smacking of skulls on headrests preceded by an engine blip-blipping on a momentary 3000rpm limit before short strips of rubber are laid. Riding in the rear is more impressive, the 1g cornering spikes, the lack of bodyroll, the V8’s cultured beat and our sometimes fearsome cornering speeds making Bernhard’s passengers feel like we’re part of a bank robbery. Except that all feels calm and under control. As does a successful assault on its 192mph top speed, the cabin impressively calm at more than three miles-a-minute. This Porsche is a hybrid. But it’s like no hybrid you’ve ever seen. Autocar being fair :- "(unachievable, in Autocar's experience) sec" mark against the Telsa. Never seen a car review before where the stats of another car are questioned. Fuelled up this must be more than 2400kg so I'm impressed it can "briefly launches this Panamera skywards.". Other than that £140,000 for such a ugly tank that can only seat 4 goes to explain why sales are slipping! To Autocar giving this a full five stars in the review then.....(whistles, drums fingers, rolls eyes). I was unfortunate enough to have been on a cruise recently and I am sure that ship was smaller than this…plus it didn't have those bloody awful neon lime lights…really Porsche what are you doing?.. Other than the cachet of owning a Ferrari, why would you buy a GT4 Lusso rather than this car. It would have reached the south of France, while the Lusso is still sitting filling up at an Autoroute station. Another stunner from Porsche. They must drop a ricket sooner or later but they really are on a roll at present. Looking forward to the GT2.